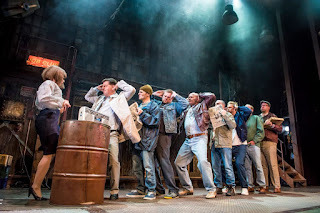 The Full Monty, based upon the 1997 film about a group of former Sheffield steel workers, is on its last tour and visits the Theatre Royal this week. Perhaps surprisingly, we had never seen the play as life seems to always get in the way, but as the show starts its final tango we decided to check it out. Simon Beaufoy wrote both the screenplay and this script too, so it faithfully recaptures much of the successful film. 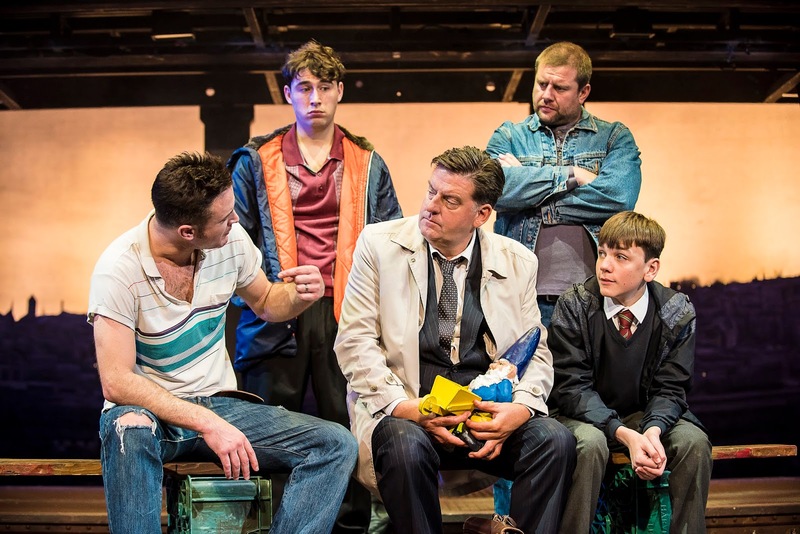 The packed Theatre Royal audience were in for a treat and the play was, in our opinion, much more rounded than the film. Everyone will have their own opinion, but to us the film seemed to be in a rush in order to get to that final scene whereas the play seems to do a better job with the build up and the personalities. The play begins with former steel workers Gaz (Gary Lucy) and Dave (Kai Owen) breaking into their old workplace in order to steal some scrap. 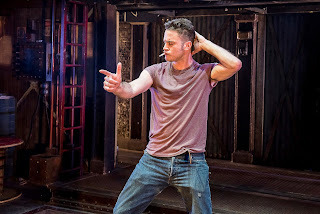 Gary hopes the money raised will help pay for, amongst other things, child support for his son Nathan (Fraser Kelly) who has joined him for their heist. Dave is more concerned with the state of the old crane that he maintained and operated for 15 years. Despite a repeated attempt to steal a girder, the lads fail. However, they do prevent the suicide of former kitchen worker Lomper (Joe Gill) who is now working as security at the steel works. After witnessing the enthusiasm that the local ladies welcome the arrival of all male dance group The Chippendales, they decide to have a go themselves. 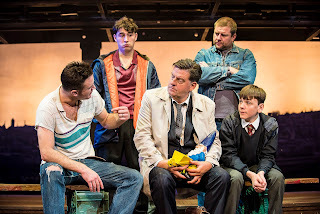 They rope in their former foreman, and local conservative club dance night regular, Gerald (Andrew Dunn), builder Guy (James Redmond) and Horse (Louis Emerick) and start rehearsals. The reorganization of the lives of 3 of the lads features regularly in the story. Gaz’s troubles with his former wife Mandy (Amy Thompson) is a key driver in his plans. Gerald’s wife Linda (Bryonie Pritchard) is happily spending on their credit card, blissfully unaware that her husband has lost his job and Jean (Liz Carney) keeps suggesting her husband Dave picks up work that would represent a big change in career path. Director Rupert Hill keeps the pace of the action moving along nicely as the reminders of why the lads are considering the “Full Monty” money making plan in the first place regularly crop up. 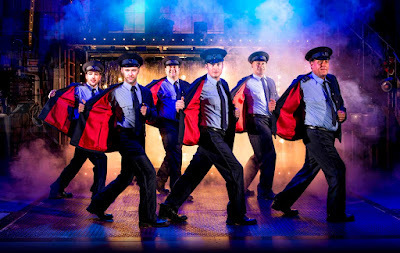 The Theatre Royal crowd get plenty of laughs along the two hour (plus interval) show. This include the early attempts of dancing seductively. 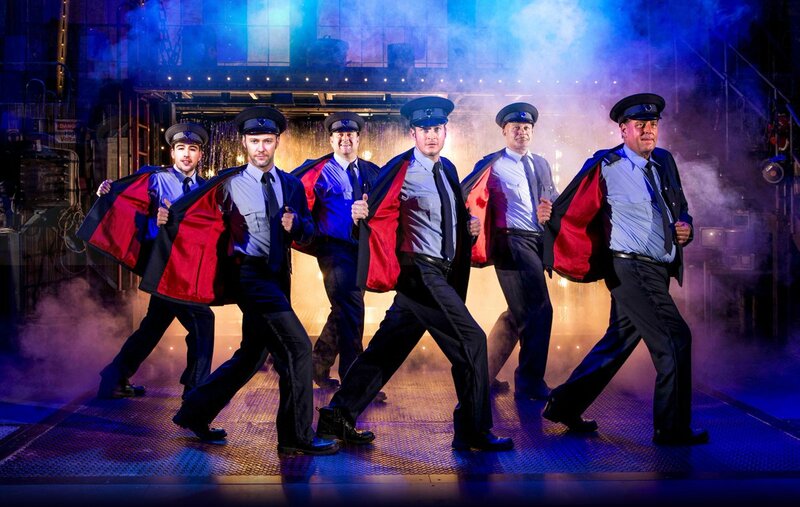 Choreographer Robert Jones works in some great routines that remind us that this is a group of ordinary lads with ordinary looks trying to do something extraordinary. 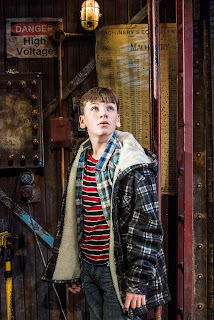 The set remains based on the steel works throughout. The conservative club, the job club, the police station and the working men’s club use the props from the factory to fashion tables, chairs and benches. This also helps with the smooth flow of the show, as the necessary equipment is to hand and we don’t have many periods of time as props are carried on and off. 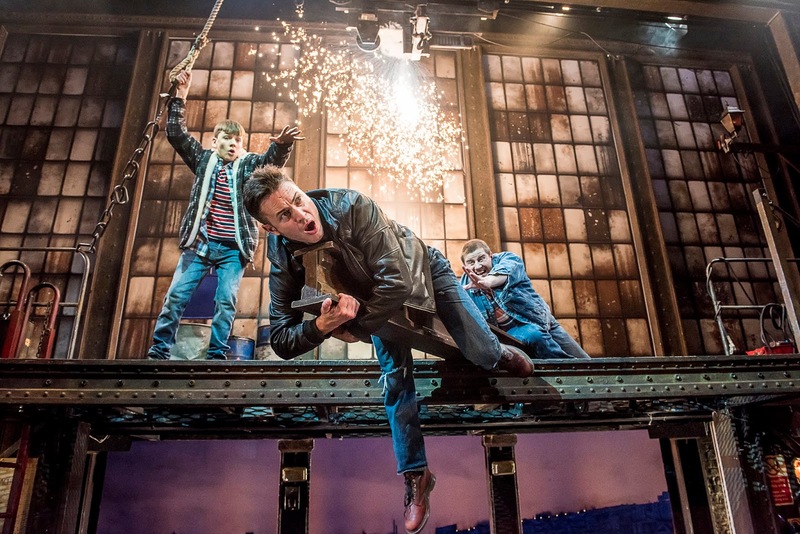 Colin Grenfell’s lighting design comes into its own especially at the end as the steel works turns into the stage for the big moment. 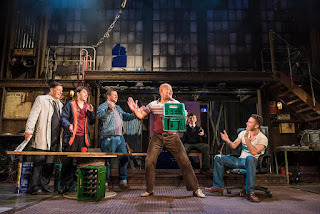 The final scene becomes interactive as the cast break the fourth wall in their performance. As the vests are thrown in to the audience there was a mad scramble by the Monday night crowd to get a souvenir of the night. The audience laugh, clap and scream and the lads get down to it. This was indeed a hoot from start to finish. The cast work well together. For example, Gary Lucy and Kai Owen, as Gaz and Dave, come across as mates who have some history together. 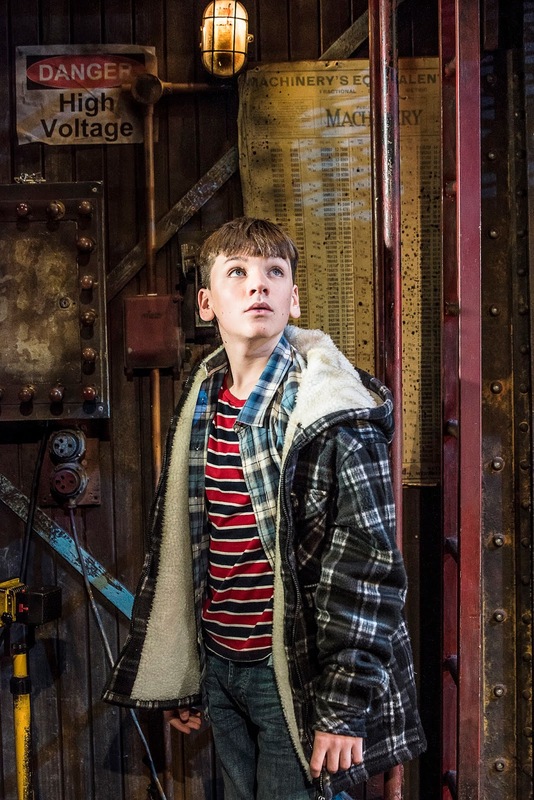 Likewise, young Fraser Kelly is one to watch as he presents a character who simultaneously looks up to his Dad but is also sick of the lack of “stability” that he represents. This is a very good ensemble cast. 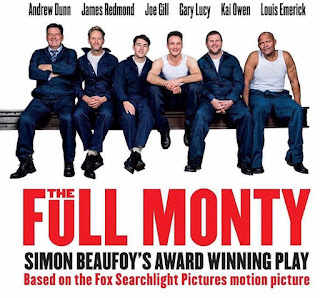 The Full Monty is a good story about relationships, depression, sexual identity, masculinity, families and the effects of the closure of traditional industries. Personally, I found the stage play more enjoyable than the film. Nothing beats being in a large crowd who are all laughing together. A good evening’s entertainment. Tickets are priced from £16.00 and can be purchased at www.theatreroyal.co.uk or from the Theatre Royal Box Office on 08448 11 21 21 (calls cost 7ppm plus your phone company’s access charge). Cannot agree with the reviewer. This was bum numbingly boring, Very view laughs and mediocre acting with the exception of Andrew Dunn. The set was cold and did not really work when the scene switched to other locations.